Boris Mikhailov. Detail from Parliament, 2014–2017. Produced from 2014–2017, Boris Mikhailov’s new photographic series became a premonition of the recently defined era of post-truth politics. 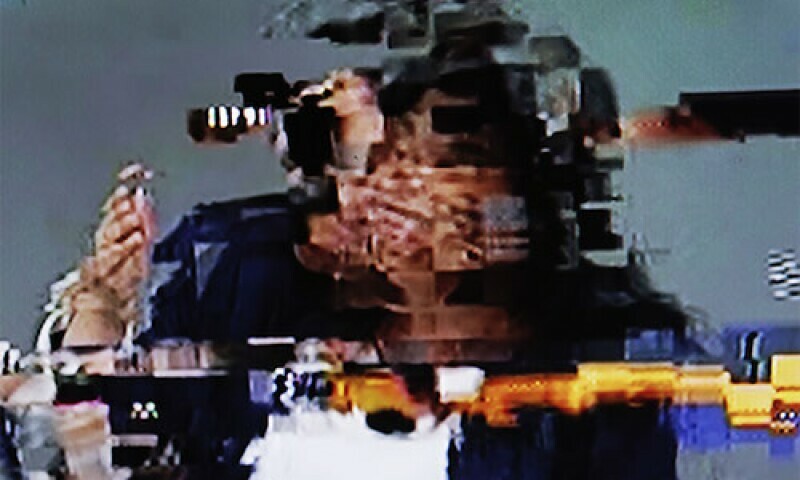 In this body of work, Mikhailov photographs television broadcasts of parliamentary debates, capturing glitches on the screen. The artist corrupts television imagery through physical intervention with the indoor antennae in his living room. Sporadic moments of sublime disorder are then captured on his camera. Parliament fits within overarching themes in Mikhailov’s practice—his interest in undermining the staged reality and the representation of a hero figure, whether it is the Soviet tradition of mass gatherings or the 24/7 news spectacle. Here, the artist uses his camera as a manmade sense organ to interrogate bodies on the screen. The data retrieved is a bewildering kaleidoscope of pixels pointing at the irony and horrors of communication. Sifting through streams of information on television, Mikhailov creates hybrid portraits of contemporary authorities in their pre-verbal state, which evoke emotions of rage, confusion, or anxiety rather than awe and trust. His photographs metaphorically portray the loss of holistic perception of reality and reference the phenomena of informational echo-chambers and the splintering of media communities.